Info on the new 2015 Beta Enduro’s have been announced, and it looks like a lot of revisions to the 4 stroke line to put them at the fore front of of the market. All four stroke engines have been lightened both in the cases and reciprocating weight. The objective being to make the bikes better handling and more effective. They have also lowered the displacement in several class sizes, a 390RR, 430RR, and a 480RR. Beta’s always have very smooth power and I am sure this is a move to make the bikes even smoother and manageable in tricky conditions. The 350RR remains the same displacement, but the big news is EFI, beta’s have traditionally carbureted, which has not been a problem as Beta designers have been great at jetting there bikes. Two strokes get only small changes, the 300 gets a redesigned combustion chamber, the 250 gets the same powervalve arrangement as the 300 which should make it much smoother. Both ranges get improved design and valving in the suspension, Beta has been working closely with Sachs to make the suspension work better each year. Another change is softer seat foam on all models, that has been one of the few comments people have made about the bikes, they say the seat is too hard! Maybe american riders sit down too much! During my short time with Beta, it is apparent they are quick to make changes based on customer and dealer input. For more detailed info, visit the Beta USA website. $25.00 Donation at sign up, lunch provided, $5.00 per person at the gate to cover lunch. Sign up 7:am, start 9:am, 2 hour race. Its Looking Like A Movement! Betas are multiplying in the East Tennessee area! 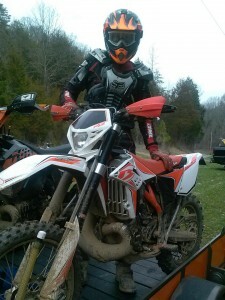 Meet Preston Teague, a KTM rider from the Volunteer Riders Club, he was riding a KTM 300 and decided it was a little too much, he then tried a KTM 200, and found it not to be enough. Thinking he wanted to go back to a four stroke, Preston then tried a new KTM 350, and although he said it was nice, the power delivery was not what he was expecting. Enter Scott Cox who recently got a Beta 520, Preston took a ride on it and immediately fell in love with it, smooth monster power but light and flickable handling. Preston knowing that him and his wife would soon be breaking ground on a new house decided now was not the time to buy a new bike, but he was able to find a good deal on a 2010 Beta 520 in Chattanooga with only 127 miles on it! After getting some riding time on it, he has declared it to be by far the best bike he has ever ridden and worth every penny. On a recent Vol Rider event at Royal Blue, Preston let Patrick Klepper ride it, and Patrick liking it so much did not want to give it back but eventually Preston got it back! ( I know the feeling!…) Russ Townsend also took it for a spin and quickly realized that he needs a new bike also! I jumped on it for awhile, and my biggest impression was it did not matter what gear you were in, first or fifth, the big thumper pulled smoothly never ripping the handle bars from your hands. I think it needs a display on the bars to indicate what gear you are in, because you sure can’t tell by the way the engine pulls! So a year ago we had no Beta Enduro motorcycles in the area, we now have five with a couple more on order! 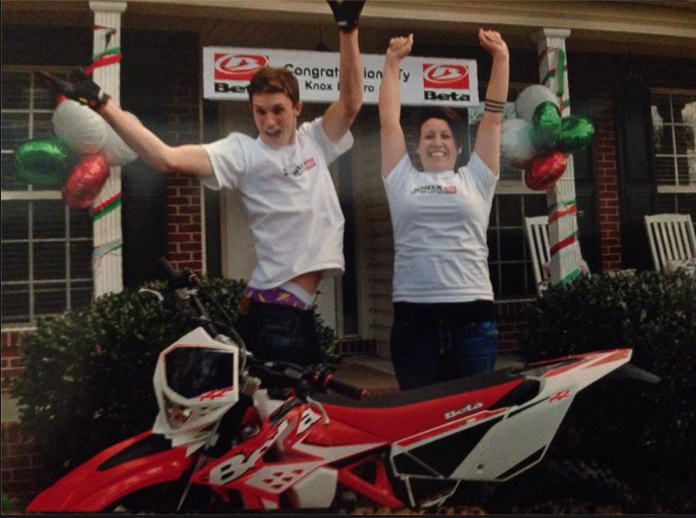 20 year old Ty Starr from who made the move to Knoxville from Virginia will be representing Knox Enduro racing his Beta 300. 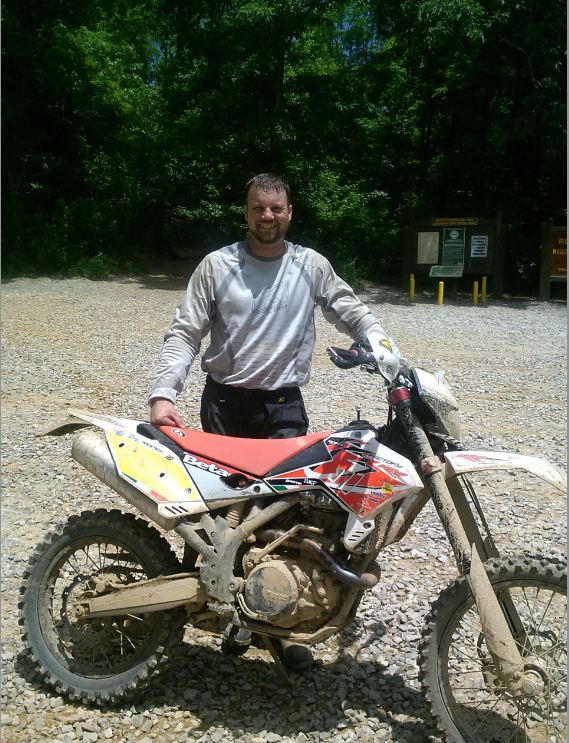 Ty is a very talented and fast racer that has experience in hare scrambles as well as extreme events such as the Tennessee Knock Out Enduro. 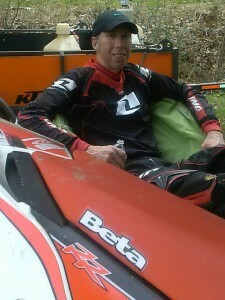 In his first event as a warm up, he won the Off Road bike class in an STRA Trials event. I saw him do things with his Beta 300 that had the trials regulars cheering and clapping. His first race was a Kentucky Hare Scramble series where he came second in Open A and fourth overall, not bad considering he had not raced in two years! Next up was the Volunteer Riders Tag Team race, Ty raced solo and won the event easily, even had time for a gas stop and take a drink of water. 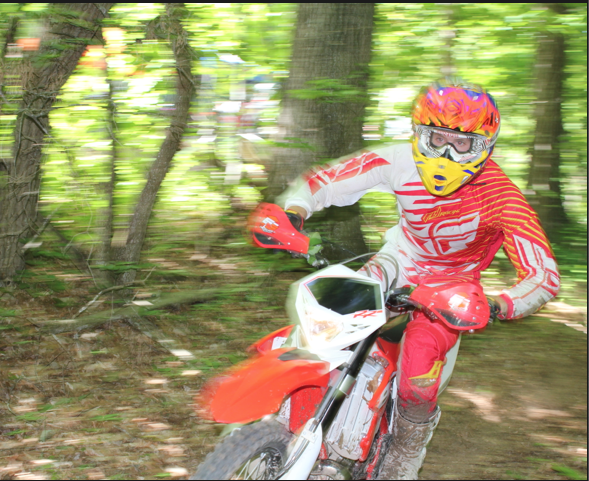 Ty then traveled back home to Virginia for the National Enduro placing seventh in Open A, which is excellent considering he started on row 118. He was disappointed with his effort, which tells us he has lofty aspirations, and he realizes he needs to ride and train more to improve. So he decided to head to North Carolina for their Hare Scramble series where he got the hole shot and led most of the way but started running out of gas physically and dropped back to second. Another great finish, and he has vowed to hit the gym to improve his endurance. Cross Fit anyone!! Next he is headed to the Trials Training Center to work on his extreme skills in preparation for Atlanta Enduro X, then the Tennessee Knock Out the next week. Knox Enduro will be at these events, come by and say hello and cheer on Ty! Knox Enduro just got in this beautiful 350RR Factory Edition, it has more bling and cool features to even list! More importantly are some rather significant changes that will propel these new 4 strokes to the limelight like their Beta 2 stroke cousins. Engine is an all new design, lighter, stronger, and less reciprocating mass for even better handling. Lighter crankshaft, new piston featuring Formula 1 technology, new head design as well as new camshaft profiles. All this delivers more power down low all the way to the top end. Bike comes standard with FMF Power Bomb header and Q4 silencer, to go along with dual map ignition including handle bar switch. 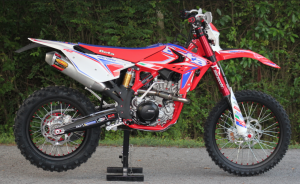 Red Marzochi forks from the Race Editions are featured, along with Supersprox Ironman sprocket, front axle pull, list goes on and on, you just have to see it for yourself! 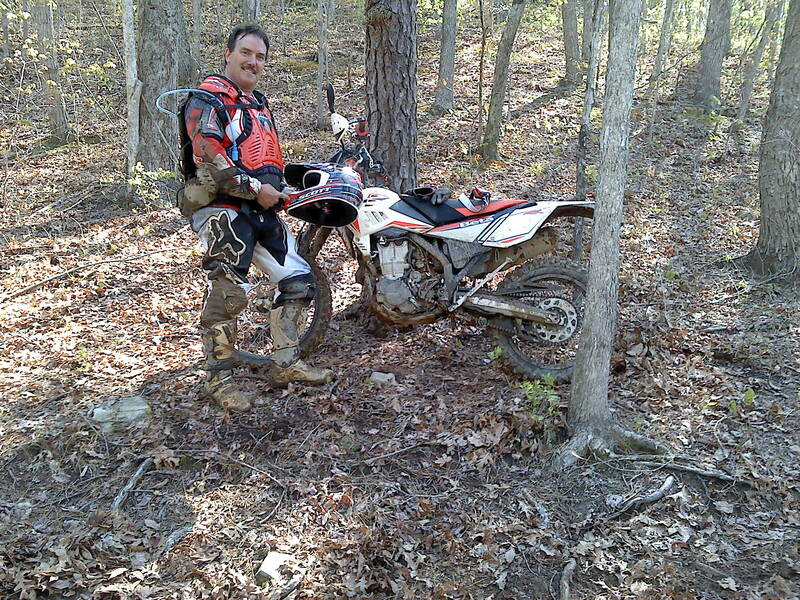 Scott Cox had been looking for a bike to Dual Sport especially on trips to Colorado, we found this very nice 2010 Beta 520RR in South Carolina, decided to take a chance on it knowing that we at Knox Enduro could take care of any parts needs. 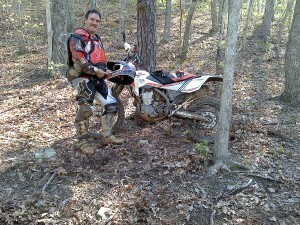 First time out he took it to the Renfro Valley Dual Sport in Kentucky and he came back very impressed! Scott says it starts great, wonderful useful power, and feels very light and flickable. He also noted that it got the same fuel mileage as the KTM 350′s that his buddies had, keep in mind it is a 520 and carbureted instead of EFI! 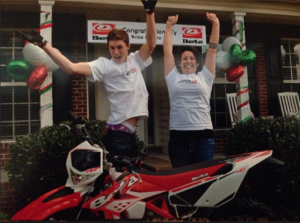 Ty Starr and fiance’ Makala Reposa are literally jumping for joy with the arrival of Ty’s new 2014 Beta 300RR. He sold his KX250 and was without a bike for a few months while he saved enough to get the new Beta. Word is he has been riding the bike and he loves it, especially the horn! 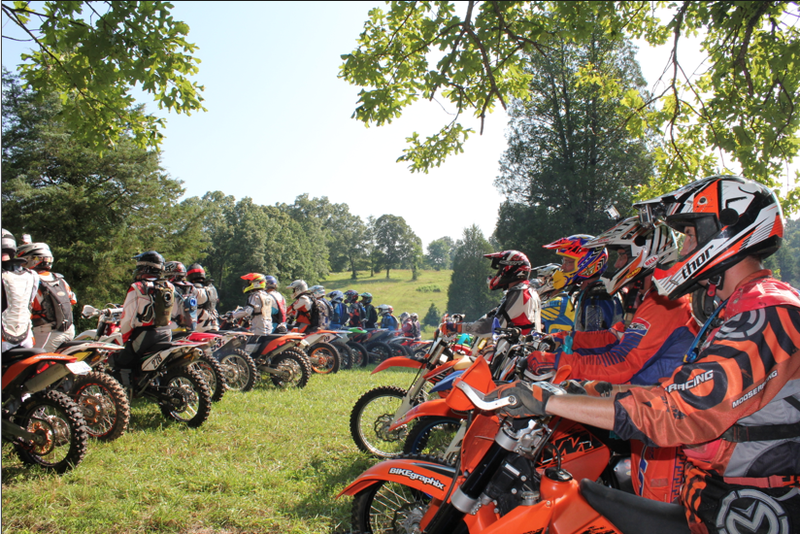 We Are Knox Enduro and We Ride! 250RR loaded back on the trailer after a great ride. 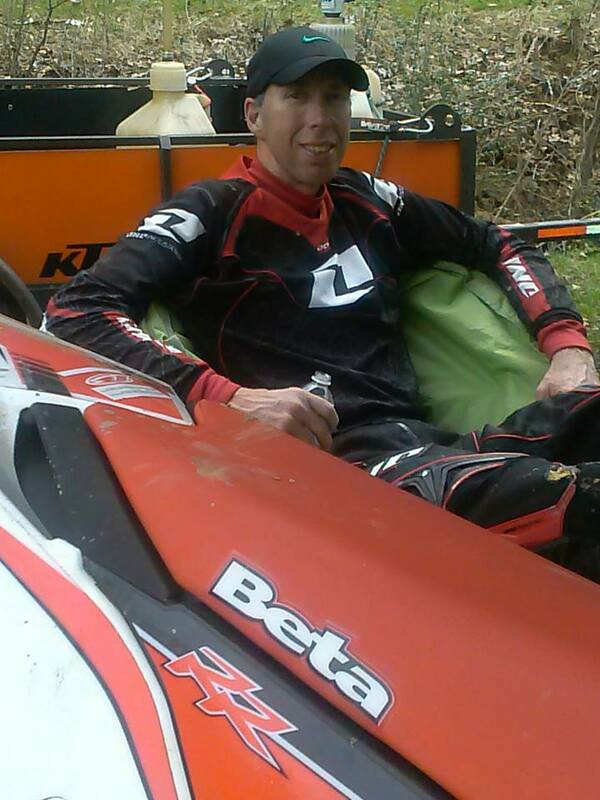 Yeah, I know, I went with a friend that rides a KTM and his orange trailer…. I let said friend try my Beta and he honestly loved it, saying he immediately felt more comfortable. Come to think of it, pretty much everyone that tries it likes it. That’s why I seem to spend a lot of time in my chair because someone always has my bike! Many ask which front fork we recommend and what the differences are so we thought we would provide some details to help better answer this question. 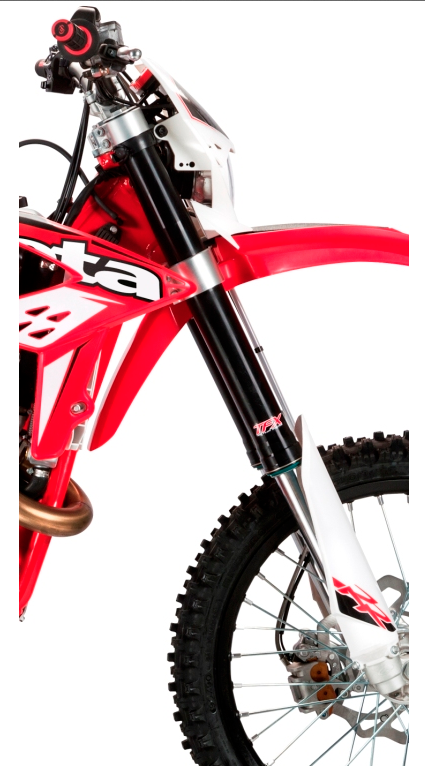 The 48 mm Sachs fork that comes on all standard RR and RS models is an open cartridge design. An open cartridge fork means it has one oil chamber. The oil that lubricates the slider bushings is the same oil that is forced through the compression and rebound pistons. Open cartridge forks tend to be more “plush” and work very well for A, B, and C level riders. Beta has been developing this fork every year since 2012. There have been many changes including piston diameter and cartridge design to enhance the fork performance. The 48 mm Marzocchi fork that comes on RR Race Editions is a closed cartridge design. Closed cartridge forks utilize two separate oil chambers, one to lubricate the bushings and provide a proper “air gap” while the second oil is sealed inside the inner chamber for the rebound and compression pistons. This fork is called a “Factory” fork as it has hard anodized tubes as well as hard anodized internal parts. 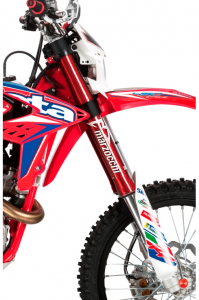 The Marzocchi fork is intended for racing therefore is valved for “race speeds”. 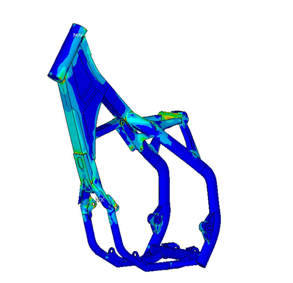 It is designed to be used by AA and top level A racers. With this in mind, under most cases, it is better to sell a standard RR model to play riders as the open cartridge fork is more compliant and will perform better for his or her riding capability. It would be like driving a Ferrari to and from work when you live in stop and go traffic. The Marzocchi race fork performs its best at higher speeds, not only MPH but when it is hitting bumps, rocks, etc at a higher rate of speed. Some B and C level riders will complain about this fork as being too harsh. As all suspension, proper spring rates, proper torque of the triple clamp bolts, oil level, and proper axle alignment are very important. Any one of these items that are not at the factory specs will alter the fork’s performance. One other item that plays a very large role in suspension performance is the air gap, it is the amount of air left at the top of the stroke when the fork is compressed. The air gap affects bottoming resistance as well as the harshness of the fork at the end of its stroke. As the oil level is raised, the air gap is decreased causing more bottoming resistance. Contact me for more information if needed. Beta 300RR on the way! 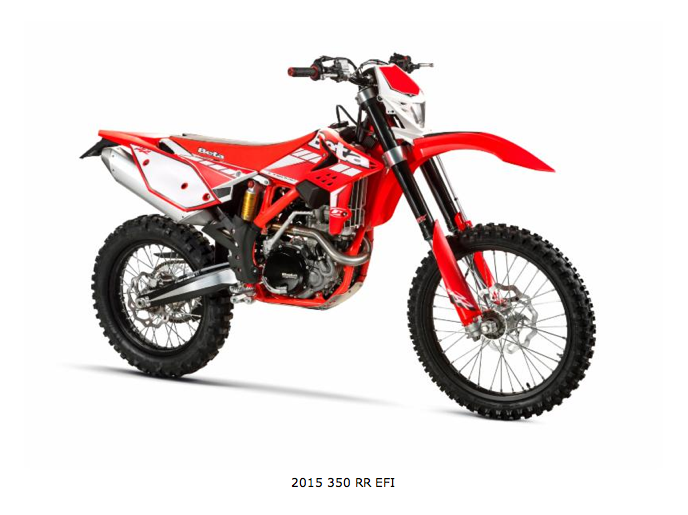 Knox Enduro has a new Beta 300RR on its way from the factory! These bikes are in demand with wait time of 3-4 weeks compared to normal 5-10 days. 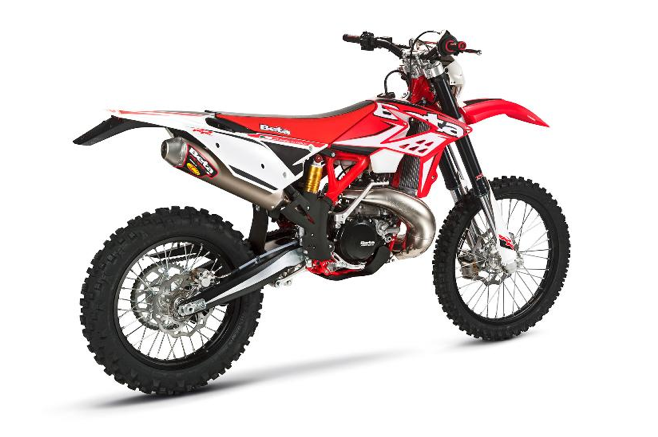 The front fork has a smaller inner cartridge as well as updated compression and rebound pistons to improve the oil flow. The valving has also been changed for an improvement over the square-edge hits. The top fork cap has been updated to make spring changes easier. Finally, new oil has been added to tie everything together. At the back end, the bikes receive a reshaped rebound adjuster which allows for a more precise adjustment. The shock also receives updated valving and a heavier rear 5.2 kg spring. The frame on all two strokes has been enhanced by reducing stress to the heavy weighted areas. As shown in the diagram, the frame areas that are in light blue or yellow are the heaviest impacted under extreme conditions. These areas are normally red in color under heavy impacts however the Beta engineering team has reduced all the areas to a yellow or light blue which represents roughly a 20% reduction of stress to the frame. This translates to less feedback to the rider, hence making the bike easier to ride and manage. The fuel tank size has been increase from two gallon to a 2.5 gallon for increased range. The tank is now a natural (clear) color making it easier to fill and see how much is in the tank. It also adds to the bikes race look. A new front fender provides better protection for the rider from mud and water. The design is stronger than the 2013 model and is more rigid in design. The seat base has also been redesigned for a better fit to the frame and provides more comfort to the rider. The seat continues to be a push button release, this along with the quick-access air filter makes for an easy air filter change.